"What's the best RC helicopter for kids or beginners" is a common question I frequently get asked; especially around Christmas time since RC helicopters are very popular gifts for kids and adults alike. The Blade Scout is one of best RC helicopter for Kids & Beginners! I'm going to give you some "kid / beginner friendly" recommendations along with the reasons why I feel these are good helicopters for both children & first time newbies getting into the hobby. Toy vs. Hobby Grade - What? First off, you may want to take a peek at my Toy RC Helicopter page since it talks about toy helicopters which is a good place to start most children off with - especially younger children (under 8 years of age). That said, there are limitations to toy type RC helicopters and for not much more money (sometimes even less), you can actually get your youngster/s a better quality hobby grade RC helicopter that they will not only have more overall fun with; but it will also last longer. Unlike toy/mall kiosk/big box store RC helicopters; hobby grade RC helicopters are almost always better in quality and fly much better. The very best feature they have going for them is you can easily get replacement parts for them when something breaks or wears out. This is something that you usually can't do with a toy heli. Once a toy heli breaks (and they all will break eventually), chances are it's headed for the landfill and I've seen first hand how upset a child gets when this happens. No question, they will still get upset when they break a part on their hobby grade helicopter, but at least you can explain to them, "we'll get it fixed and it will be good as new". To me, that is worth a few extra bucks over throwing money down the drain on a disposable toy. Hobby grade helicopters also allow you to purchase extra LiPo flight batteries for back to back flights. Most toy grade helis have built in LiPo flight battery packs and you'll have to wait an hour up to two hours after each 7 minute flight to recharge them. This is the single biggest complaint you see on most toy heli reviews; the short flight times and the long re-charge times in-between. I'm sorry folks, but 5 to 10 minutes is the norm for most electric RC helicopters - toy and hobby grade alike! Current LiPo battery technology is just not capable of cramming more capacity into a light weight rechargeable package. 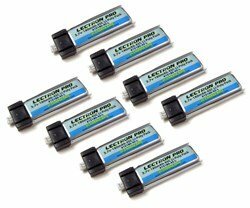 Small capacity LiPo's also can't be "fast charged" so forget about a less than 1 hour recharge time. At a 1C charge rate (the recommended for all small LiPo battery packs), it takes at least an hour to recharge them. Thing is, at least hobby grade heli's allow easy battery replacement for back to back flights; so although flight times won't be longer, you won't have to wait for an hour + to go flying again; just pop another charged battery into your bird. There is a real reason however why toy helicopters have only built in LiPo flight batteries and that is to prevent a possible choking hazard that a small replaceable part could cause. Toy's are for children after all, so no question that safety aspect has to be taken into account in your decision when deciding between a toy and a hobby grade RC helicopter. The other benefit with hobby grade is you can get knowledgeable help from the hobby shop or the manufacturer should you need it for problem's, repairs, or even recommendations. You rarely if ever get service like that with the toy/mall/box store stuff. In fact, it's rare the person selling them at such places even knows the difference between a coaxial helicopter or multi rotor never mind how they actually work and which one is the best match for your particular child or beginner RC helicopter pilot. In short, before making that impulsive toy/mall kiosk/box store RC helicopter for kids purchase, do a little research or pay a visit to your local or on-line hobby shop to see what they have for not all that much more money. No longer are all hobby grade RC helicopters super expensive, hard to fly, and meant for seasoned RC enthusiasts only. With all the micro coaxials and micro quadrocopters, you can get easy to fly quality hobby grade RC helicopters now for under $100 dollars. In fact, some are under $50 so they are not much more expensive than most of the toy stuff at all, yet offer superior value and most importantly, superior fun. 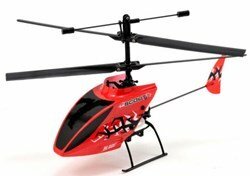 How Much Will A Hobby Grade Helicopter For Kids & Beginners Cost? I'm trying to adhere to an under one hundred dollar budget since most people who contact me with this best RC helicopter for kids or beginners question want to keep the price under $100 bucks or less. I do have a few more suggestions that cost more if your budget is a little more flexible or you are purchasing one for a BIG kid at heart. That is the one thing to be aware of. You may be purchasing this RC helicopter for your or someone else's child, but chances are you or other adults are also going to be having fun with it too. As you have likely guessed, all the RC Helicopter for kids recommendations I'm going to be giving you are for economical hobby grade helis. Again, if you want to go the toy helicopter route, check out my toy helicopter page for more info on them. The ones I'm recommending (Blade & Hubsan) are sold at most good hobby shops so it should be easy to find them and to then get parts for them when required. To be kid & beginner friendly, all these RC helicopters & quadcopters are ready to fly out of the box (no building required), robust, and naturally fairly easy to fly. The majority of my recommendations are also very small in size and will fit in the palm of your hand. Small micro sizes are good in that they have very little mass, and less mass = less energy dissipated when they crash or hit something. In other words the smaller and lighter they are, the less likely they are to break a part/s when they crash. 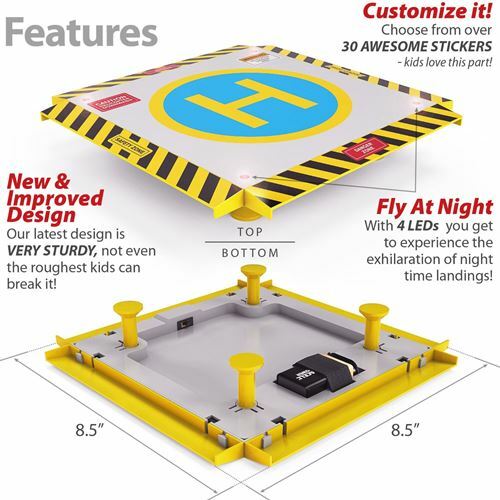 This makes them not only more crash resistant, but also less dangerous to the child but less damaging to items in your home as it's pretty much inevitable that your young student pilot will have a few less then perfect first flights. That said, all these little RC helicopters for kids & beginners are still flying aircraft with spinning propellers or rotors on them. The micro size ones don't have enough power/energy to cut through skin, but they can sting when the blades contact bare skin and they are certainly capable of damaging soft eye tissue. Don't fly them around pets either for that very reason! Using common sense and caution go a long way. 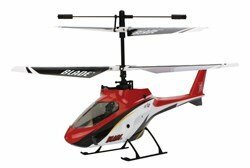 Most of these kid friendly hobby grade RC helicopters are recommend for ages 12 and up, but depending on the child and the level of help offered by an adult at first, that age limit is of course a recommendation only. I know a few eight & nine year olds who can fly any of these kid friendly helicopters & quadcopters better than their parents can, so it all depends on the natural ability of the child. I have links to each helicopter & quadcopter so you can learn more about each one along with ordering information if you wish to purchase online. I have also included a few videos on some of the models so feel free to watch them or better yet, show them to your young budding helicopter pilot and get his/her input. First up are micro coaxial RC Helicopters. These are generally the type/design of RC helicopters that most toy/mall/box stores offer, but the ones I have listed here are true hobby grade quality with proper tail gyros & cyclic control. This is the best first time RC helicopter for children & beginners on the market right now in my opinion. They are light, tough, and not overly complicated to fly due to 3 channels of control over the slightly more complicated 4 channel variety. They also don't have any complicated "mode" selections to remember or access. This is as basic and simple as it gets. This is still my personal goto gift heli for kids & beginners of all ages who have never once before controlled anything by radio control. A great looking, high quality, and high performance 4 channel micro coaxial heli- here's my full review. This category is fairly new, only being made possible by today's electronic stabilization with self-leveling technology, that has now started showing up in very reasonably priced models. These are not ideal "first" helicopters for kids. They are more difficult to control than micro coaxial types and have more power; so crash damage can be more substantial as more energy is released when they hit somehting. They also fly faster and have better performance. That said, for more experienced kids or beginners who are really interested in RC helicopters and want to start with something that will enable them to gain important flying skills for more advanced RC helicopters while not breaking the bank, these are a solid/best choice. 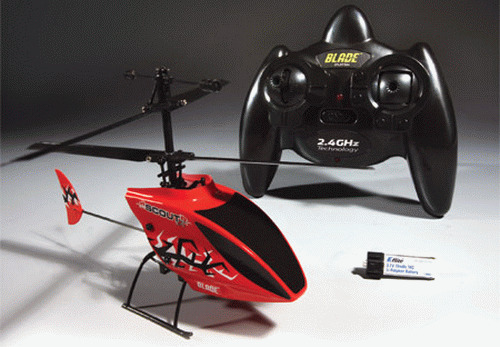 The Blade 70S is a more advanced single rotor micro heli, perfectly suited to the beginner heli pilot. Here is my full review. It's a great choice for those that are seriously thinking of getting into the hobby, yet don't want to spend much at first. The value is quite outstanding considering helicopters like this used to cost well over $160.00 just few years ago. The fixed-pitch flybarless design offers unmatched stability. The low part count makes repairs quick and simple. Plus, all the electronics are contained by an extremely durable composite plastic frame, making bumps and crashes stress-free. For the eBay shoppers out there; the same re-branded heli is offered by Esky but is a different color. It's called the 150 V2 if you want to have a look at it as well. Here's my full review on it. 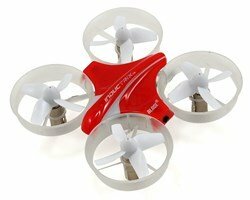 The Hubsan H107 is a very popular quadcopter for children & beginners alike. Next up are the quad-rotors - the latest and greatest thing in easy & fun to fly RC right now. Quadcopters/quadrotors (quads for short and very incorrectly also called drones) are perfect RC helicopters for kids (big & small alike). They are more performance minded over the micro coaxial helicopters and most are more challenging so they may not be the best option for younger children unless they already have some RC heli experience with a toy or hobby grade coaxial. Also, unlike a traditional helicopter shape, many quads are very "symmetrical" looking front to back & side to side which can be problematic for some. When they are so small with all orientations looking so similar, it can be difficult knowing which way they are facing when flown further away which can make control difficult. Some come with different colored bight LED's on the corners to help with orientation so you know which way they are facing, but a little colored tape on the front, back, or sides can help with directional orientation too. All offer 4 channels of flight control (lift, pitch, roll, & yaw). Most also have selectable flight modes for easier flight while first learning and then select the more aggressive flight mode for aerobatics. Micro quadrotors can however handle small amounts of wind outdoors much better than micro coaxials so if outdoor flight is an important consideration, a quad might be the better all round choice. 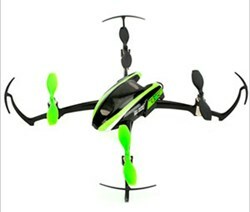 Some even come with a built in video camera for taking fun aerial video footage. Most quadcopters are also very crash proof as there are very few moving parts on them which also makes them easier to fix when something does break. Usually just one or two of the very inexpensive propellers get damaged. Pop the busted one off, and slide a new one one - done! Below are some of my favorites based on my experiences and visitor feedback. 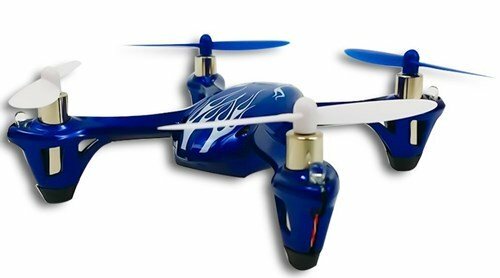 The Hubsan X4 H107L is a very popular beginner micro sized quadcopter that is carried at most RC hobby shops and other RC outlets. They are tough little things with a hard plastic case that can take an impressive amount of abuse. 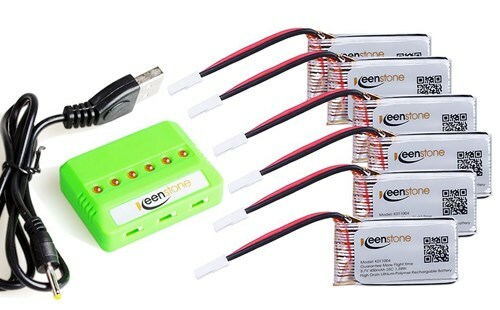 As they are a true hobby grade quad, you can easily get inexpensive replacement parts for them, additional accessories, and of course, you can get extra battery packs & multi port charging stations as shown below. The Hubsan H107's, being so popular, means there are also lots of videos and help tutorials out there for them. I've had an H107 for several years and it's still going strong. I've replaced a few propellers and that's it for repairs - simply amazing! I, among most of the people who contact me, feel this is the best beginner micro quad on the market right now. The value is there, the quality is there, and the performance is there. The Inductrix uses tiny electric ducted fans over more exposed propellers making it a little safer for younger children & pets in the vicinity. The fan housings however are fairly frigile and will break if constantly crashed. Ducted fans are also a little quieter than similar size exposed propellers. The Inductrix is an ultra micro quadrotor that can be flown just about anywhere by anyone. The fan housings inherently prevent damage whether it’s bumped into walls or falls into the grass. Brilliant LED orientation lights and a sleek body design help keep you going in the right direction. Innovative SAFE® technology with self-leveling makes staying in control easy, even if it’s your first flight. Putting some colored tape on the front or back of the Inductrix, will help with directional orientation as well I find. Never flown a quad-copter before? No problem. The Nano QX uses the SAFE™ technology system with sophisticated flight control software to keep itself stable in a hover while in stability mode. If you get in trouble, just let go of the sticks. This has to be one of the best looking little micro quadcopters currently on the market. It's the ideal helicopter for kids or new pilots and anyone who wants a fun flying experience; but you'll have no trouble keeping it together. That's because the SAFE® system of the Zeyrok quadcopter is designed with multiple flight modes to provide the kind of confidence-building flying characteristics that makes lift-off as smooth as possible. As a result, you can rock from beginner to expert quadrotor pilot at the pace that's right for you. The optional camera pod with landing gear is removable so you can quickly turn this nimble quad into a lightweight HD camera drone. Flying indoors or out, the Zeyrok is your ticket to having a blast with a quadcopter. An AP Zeyrok version is available as well (has an onboard camera) for about $40 bucks more - very fun! As you can see, other than a few costlier exceptions, a true hobby grade RC helicopter or quadrotor for kids or beginners doesn't have to cost much more than the toy type. They give you more helicopter & quad value in most cases, way better control, overall better quality, the ability to fix them when something breaks, and with extra battery packs - way more back to back flying fun! This video gives a really good primer on Toy Grade vs Hobby Grade if you are still a little foggy about some of the differences. No matter what small micro beginner heli or quad you end up getting, these little 8.5" Helipad's really add to the overall fun & enjoyment while building landing skills at the same time. I've always dismissed these things as a total waste of money, but a buddy of mine got one for his son. After seeing how good he was getting landing his little Blade mCX2 on it with a big grin on his face, I quickly realized what a great little accessory it was. Anyways, it was pretty entertaining watching him and I now realize these little landing pads do have merit. 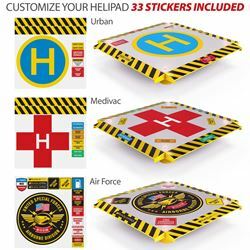 They also come with an assortment of sticker sets allowing one to customize the pad to their liking. My buddy's son also uses his little Helipad as a display platform for his mCX2.